A sleepy mood, subdued but not unpleasant, pervades the ship this morning. It’s no coincidence. Clouds in varying shades of gray hang low over the ocean, and the surface, azure in the sunlight, has absorbed the day’s gun-metal hue. The northern edge of a deep low brushed us overnight. Nothing serious up here, but from the look of the smudgy isobars on the weather map, you can see that if we were situated 100 miles south, the mood aboard Knorr would hardly be sleepy and subdued. Weather, which is to say wind, rules aboard this vessel as surely as it did centuries before there was such a thing as engine-powered ships, many more before there was such a thing as ocean science. Today, sky and sea in a dolorous mood, the wind is slack, and people were talking over breakfast about afternoon naps. Science has ceased, the after deck empty. Yesterday they launched the seventh and final mooring. Lisa showed us the plot indicating its precise location, the triangulated fix obtained by “talking” to the acoustic releases from three different positions. They landed the anchor within 200 meters of her planned position, pretty impressive considering that the Agulhas was hurtling along at four knots. 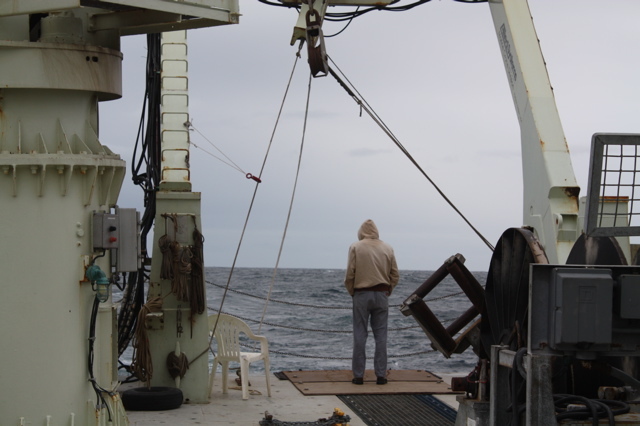 Now we’re steaming from the seaward end of the study line back toward the continent and the position of the first mooring, designated “A,” 110 miles away to the northeast. That’ll take all day. Little for the science staff and deck crew to do but ride along, and that contributes languidness. We’re heading back to retrieve mooring A, because, when deploying mooring B, Mark and Robert noticed that the top float was upside down. They immediately winched it back aboard and bolted enough lead to the bottom to remedy that design flaw. And they did the same to the remaining five mooring balls before launching them. But for various reasons not their fault they hadn’t noticed anything amiss with mooring A. Once in the water and anchored to the bottom, the top float would remain upright due to the downward pull on the wire, no problem. The problem will arise once the mooring is released for retrieval and the top float carries it to the surface. The upper side of the elliptical-shaped float is armed with a strobe light to call attention to its position once it pops to the surface. 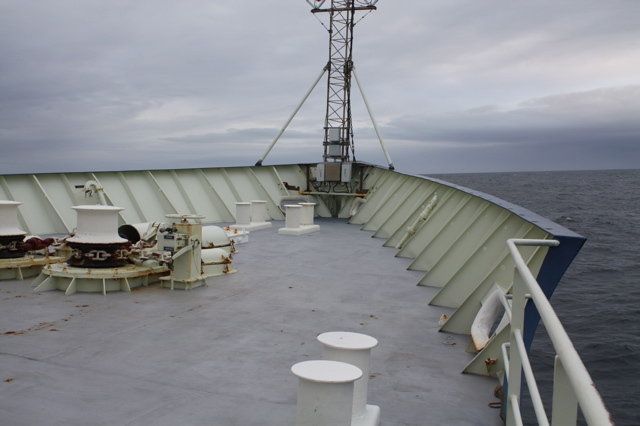 In addition to this low-tech means, there is a VHF transmitter that will broadcast its position within a mile of the ship. And then there is the decidedly high-tech ARGOS transponder. ARGOS is the acronym for a satellite system in Earth orbit. It’s been an enormous boon to oceanographers, allowing them to drop surface instruments anywhere in the ocean and go home. Then, logging into the ARGOS system from the comfort of their office, they can follow the progress of their instruments, thus learning something of the dynamics of any piece of ocean they choose. For moorings, ARGOS serves as another layer of safety. Say six months from now one of Lisa’s mooring broke free from it’s anchor; as soon as it cleared the surface the ARGOS transponder would begin reporting its position. Without ARGOS, no one would know that the expensive gear was adrift. It would be gone, along with its valuable data. However, each of those retrieval aids will be useless if the mooring ball were floating upside down. And so we steam at eleven knots under leaden skies for mooring A. Let’s hope we’re able to eyeball the thing when they trigger the release tomorrow. Every chief scientist budgets several extra days into his/her requested ship time to cover bad weather and other unpredictablles inherent to ocean work. They all hope for uneventful, boring cruises, collect the data, go home happy, but they know better than to expect them. It became a kind of joke for a while. 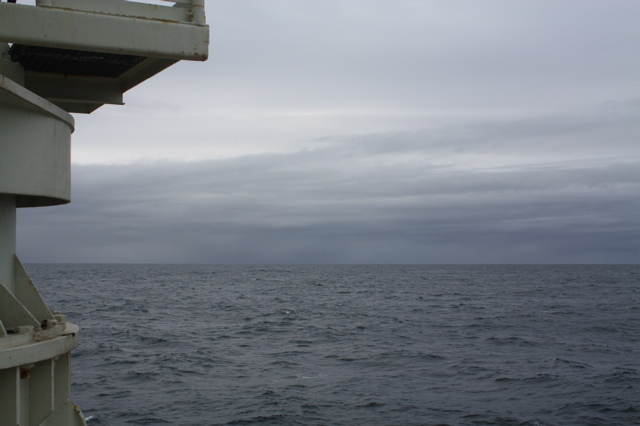 “Yeah, you ought to see the Agulhas,” whenever anyone extolled the virtues of anything. Now I see what she meant. 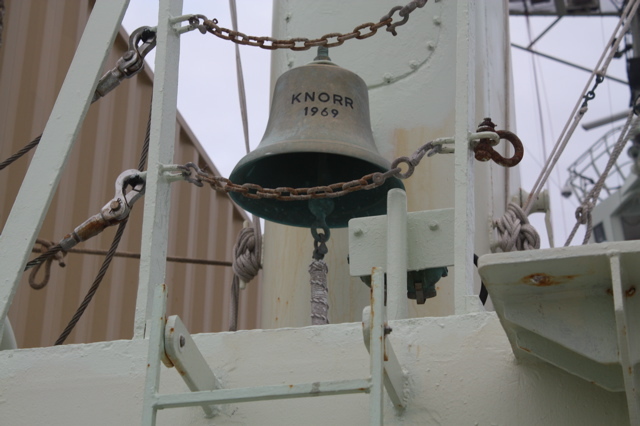 Even the old hands aboard Knorr are impressed, and no one’s laughing.